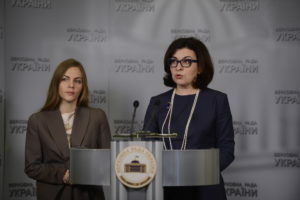 According to the Vice Speaker of the Verkhovna Rada Oksana Syroyid, the events connected with the selection of candidates for the Constitutional Court, which are now taking place, are an indicator that the Yanukovych regime is flourishing. She explains, “Immediately after the Revolution of Dignity, the parliament managed to bring itself to dismiss the five judges who were appointed according to the quota of the Verkhovna Rada. Out of fear of people, the parliament appointed well-known and respected lawyers instead. Then the parliament also appealed to the President and the judiciary with a request to withdraw their quota of judges from the Constitutional Court. Samopomich MP Olena Sotnyk underscores that almost all Ukrainians will be able to feel the “effectiveness” of the body. All they need is to try to use the instrument of constitutional complaint provided for in the new law on the Constitutional Court. She notes, “The constitutional complaint is an opportunity for every Ukrainian citizen to apply to the Constitutional Court. Today, given those politicized processes of selecting judges, we can state that this tool for citizens will inevitably turn into yet another way of judges’ enrichment.